Dubai: Mental health is the next global epidemic, according to speakers at the ‘Mitigating the risk of the next global epidemic’ session at the World Government Summit on Sunday. Described as a ‘silent killer,’ stress has been reported to be the root cause of various illnesses and conditions, with depression and anxiety rates in the UAE among children and adults reaching 80 per cent. Speaker Ariana Huffington, founder of Thrive Global, said she didn’t consider fatigue, and lack of sleep as alarming signs of an overly stressful lifestyle until eventually collapsing in her office in 2007. “Two years into building Huffington Post and being the mother of two teenage daughters, I collapsed from exhaustion, sleep deprivation and burnout, hit my head on my desk and broke my cheekbone,” she said. She pointed out that many people often live in “fight or flight” mode and have forgotten what it’s like to feel “recharged” and well-rested. This perception has led many people to neglect their basic mental needs, creating a crisis both in mental health and chronic diseases. “We have an explosion, especially in the region, of diabetes, obesity and heart problems,” said Huffington. Sharing her own daily tips with the audience, Huffington recommended taking micro steps to transforming the way you experience stress. “Pick a time to declare the end of your working day, turn your phone off and charge it outside your bedroom. The second micro step is to take one minute when you wake up in the morning before you go to your phone to remember what you’re grateful, and then set your intention for the day,” she advised the audience. 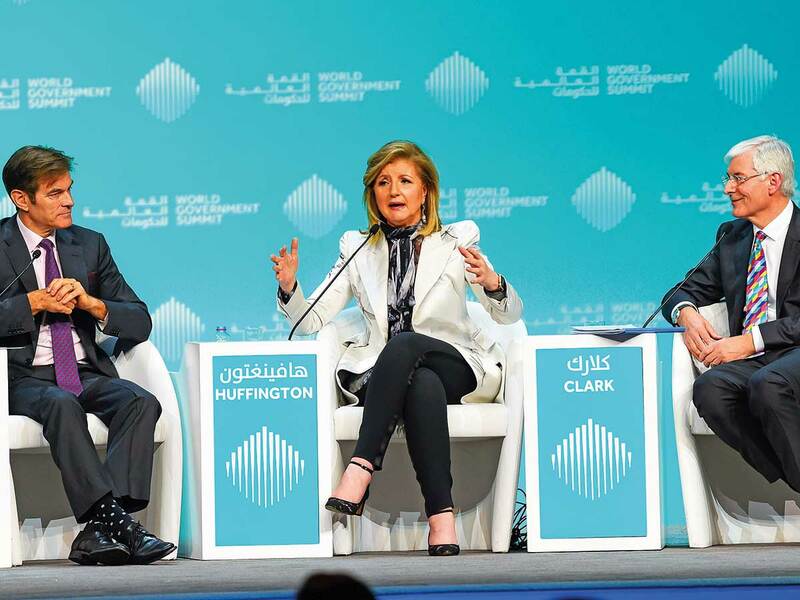 Commenting on the especially fast-paced, dynamic lifestyle many residents in the UAE lead, Dr Oz, from the Dr Oz Show, said the estimate cost on global mental health will be $16 trillion by 2030. A survey called the real age study taken by 35-40 million people, which looks at how old your body thinks you are, shows that major stress takes six years off your life expectancy, he said. Dr Oz measured the number of hours of sleep people in the UAE get a night through an app called ‘Sleep score’ used by residents for the last few months, versus users in the western world. “In the UAE, you lie in bed for three minutes shorter than people who live in the west, but your sleep quality predicts that you’re sleeping five hours and 38 minutes, which is 20 minutes shorter than in the west,” he said. To provide some context, he pointed out that the impact of sleeping pills give you an additional 9 minutes of sleep on average, meaning that a person would need to take twice as many sleeping pills in the UAE to get as much sleep as the average person in the west. “Sleep is a barometer of stress,” said Dr Oz. Discussing the solution to improved mental health worldwide, Professor David Clark, Chair of Experimental Psychology at the University of Oxford, said three to one prefer psychological therapy to medication. He pointed out that recent advancements in mental health have shown effective psychological therapies, with the problem hinging on unavailability to the public in most countries. “When it comes to mental health we have treatments that work very well, but they are not implemented and they could be at zero net cost. This is an epidemic that is different because we have the solution we just need to get on and do it,” he said. Dr Clark explained that making psychological treatments widely available will be done at no extra cost but significant gain as it results in people needing less physical care.